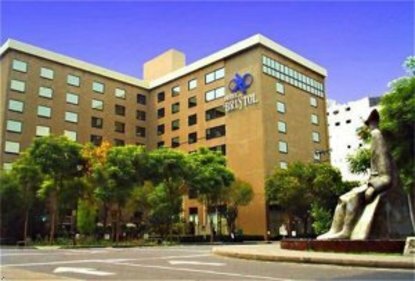 The Hotel Bristol is located in the category of city hotels, the location is ideal for business travelers, or persons that like enjoying the tourist magic or cultural sites that Mexico City has to offer. This hotel offers banquet and meeting rooms, restaurant, bar, parking area and many other services are provided by the hotel. The Bristol Hotel is located 10 miles west of the Mexico City International Airport and a step away from the pink zone (Zona Rosa) where the best restaurants night clubs banks and tourist attractions are, it is where the cultural life along with contemporary architecture and modern building holds facilities ideal for your business trip.